MUMBAI — Brad Pitt told Indian actor Shah Rukh Khan that he doesn’t have the moves to star in Bollywood films as he promoted his new movie War Machine in Mumbai on Wednesday. "I wouldn’t make it Bollywood because I can’t dance or sing," said the American actor during an event with Khan in front of journalists in India’s financial capital. Bollywood Hindi language movies are renowned for elaborate dance sequences and high-energy songs and Khan responded by telling Pitt he could easily learn. "We can make anyone dance. I just spread my arms and do nothing, that’s a step," joked the actor known as King Khan. Pitt, who recently split from Angelina Jolie, arrived in Mumbai from Japan early on Wednesday for the latest stop on a promotional tour for Netflix movie War Machine. 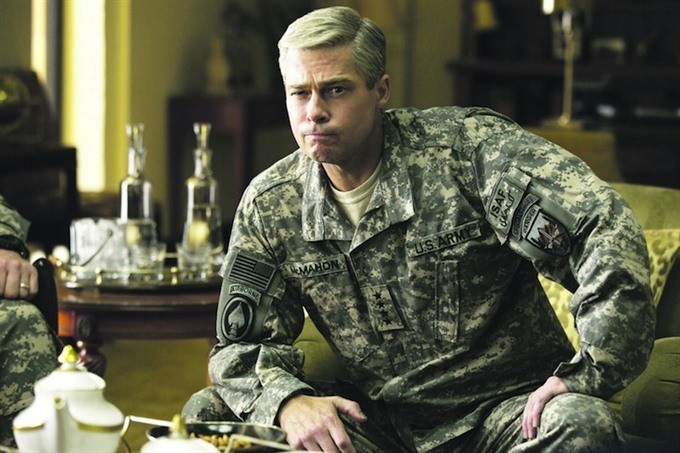 The satirical war film, in which Pitt plays a hubristic United States general, releases on the popular streaming site on Friday. Pitt, 53, was due to attend a screening of the film, directed by David Michod, in Mumbai later on Wednesday. It was the star’s second high-profile visit to India after he accompanied ex-wife Jolie during her filming of A Mighty Heart in 2006. Earlier this month Pitt opened up on his divorce from Jolie, admitting that heavy drinking had contributed to the breakdown of his marriage.